Dearest Heavenly Father, We come to Your feet today to lift up our hands in praise and magnify Your Holy, all-Powerful name. We also call upon You in faith today . 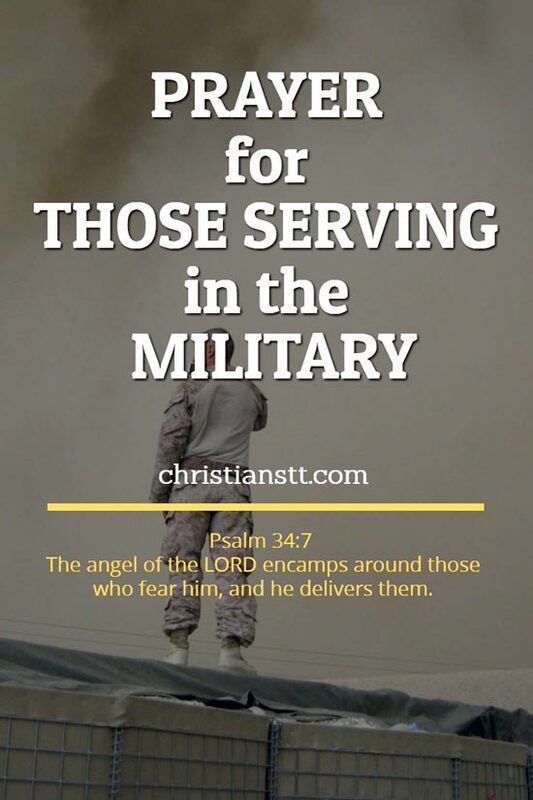 Lord, hear us as we pray for all military soldiers serving in deployment around the world. In war-torn countries, which are so far from their homes, those that put their lives unselfishly on the line each day so that we may feel safer. We humbly ask You to place Your Mighty arms around them. Guard them from the evil one and from those that plot and plan against them with violence and destruction. Please fill their hearts with firm determination, unflinching courage and that peace that surpasses all understanding. Father God, may our brave heroes always overcome any fear that has found its way into their hearts. May our soldiers be able to overcome this fear and trample it underfoot because of Your Mighty power, and because Your amazing and redeeming love shines upon them. Please place Your angels around them each night as they sleep and let Your eye, ear and hand be on each serviceman and woman. Psalm 34:7 The angel of the LORD encamps around those who fear him, and he delivers them. Psalm 139:5 You have enclosed me behind and before, And laid Your hand upon me. Almighty Father, we beseech You to protect our dedicated warriors with your Mighty Shield of Strength. Keep them all from harm and return each one of them safely home again into the waiting arms of their loving families. Psalm 61:3 For You have been my refuge a strong tower against the foe. We ask You to hear our prayer Father, in the name of our Redeemer, Your Son, Christ Jesus. Amen. Thank you Marie for the powerful prayer. Lord , in your mercy hear our prayers. Dear Bervelyn please know in your heart that our Father hears every heartfelt prayer. He listens my dear and He will answer. He loves our soldiers so very much and He knows each and every one of those that are out there today making the world a safer and more stable place for us and our children. He loves you and I so very much because He made us and loved us first. May God bless you and protect you and make His light shine on you. Yvonne Marie Miller. ???? Heavenly Father our God, we continue to lift up our men and women in service. Father God in the name of Jesus I ask you to cover them with the blood of Jesus. Let them know that they can do all things through you who strengthens them. Father continue to give your angels charge over them. Provide for the families they left behind. Give themyour peacce that transcend everything.